Murano is discreet, opulent, quiet, lush. It is hushed, silvery, polished and plush. It has beautiful glassware and exquisite wall lamps with shimmering, nacreous drops. It is a proper little restaurant, of which there are surprisingly few in London. It wants to be generous, which is even rarer. Before the food you order arrives, you are given canapé bowls of crispy arancini, then a wooden platter covered with folds of sweet, rich ham; the slices as thin as silk. A wooden box of breads includes shards of crisp carta da musica and squares of moist, savoury focaccio. Olive oil is poured into a folksy ceramic bowl with great ceremony. ‘It is Planeta. From Sicily,’ says a waitress, as if it was holy water. Perhaps it is! Although it wasn’t the last time I consulted my book of Twaddle de Ristoranti (Vol 1; Pre-Pre Starters). The end of the meal is heralded by a cavalcade of sweetmeats; tiny glasses of tiramisu, buttons of sorbet in different flavours served on a tiered stand. ‘I don’t know if I’m ready for pesto ice cream,’ moans S, his lips making a pained, trumpeting sound as he tries the basil flavoured one. Squidgy chocolates, raspberry popcorn and rolled wafers of praline studded with nuts and spices follow. All very interesting and purportedly generous, in the modern manner. Yet is it really? Our first impression of Murano, which is run by Angela Hartnett and is part of the Gordon Ramsay group of restaurants, is that it is Italian-themed, rather than Italian proper. Mayfair Italian rather than authentico Italian. There is, for example, no dedicated pasta course. Farinaceous elements are provided by a single ravioli dish (crab, one big fat pouch in time-honoured Ramsay tradition), tortelli and potato gnocchi. Yet elsewhere, luxury abounds. The tablecloths are of the very best linen.The menu creaks with the finest meats and garnishes, while the service is attentive to the point of…if one more waiter tries to pour more water or wine into my glass I SWEAR TO GOD I will stab them in the back of the hand with this fork. Please leave it. Leave it! Leave it! The 60-seat room is subtly divided into two; the front half with the bar and its temperature controlled wine caves, the back end with a picture window looking into the cramped kitchen. This rear area, which can be glassed off and used as a private room, has a large table that emerges from beneath the floor, a bit like Thunderbird 1 emerging from the swimming pool. It’s fine if you want to watch a lot of sweaty blokes chopping veg - and apparently many people do. Hartnett herself is in the kitchen tonight, nodding at dishes on the pass as they go out and keeping it real in the way only she can. There are a lot of good things to eat. A salad of scallops with roasted watermelon and Iberico ham is delicious. Superb, juicy golden scallops are cooked just right; the salty ham a nice counterpoint to their creamy sweetness. Vitello tonnato cleverly has the lightest tuna sauce, served under the rosy slices of veal, which are piled in soft waves on top. Little chunks of pickled fennel add a touch of briskcrunch while a pair of anchovy beignets completes the dish. Very elegant. Other starters include a pressed rabbit mosaic with rosemary toast; and a Swiss chard and ricotta tortelli with a sage and butter emulsion. Main courses include an elegant dish of tender slices of Gressingham duck fanned on a plate with a cake formed of shards of confit leg and potato. Less successful is a piece of turbot cooked on the bone and served with an overwhelming smoked ham stock, in which bobbed some pearl barley. Perhaps we should have known better. After all, we are given a clue when the waiter says: ‘The ham stock is a little overwhelming.’ Which makes one wonder why it is on the menu in the first place. The stand-out pudding is a copper dish of zabaglione, gloppy and rich with Marsala and whisky, full of heart and totally terrific. It is supposed to come with spiced figs but unfortunately, Hartnett herself had eaten them all. ‘I just kept picking them out of the bowl,’ she told one diner. Chocolate and chestnut semi-freddo is faultless, although a frozen pannacotta is not improved by its temperature altered state. Yet overall, Murano is a tremendous new restaurant, a fabulous addition to the London dining scene. People will love it here, with its nicely spaced tables, friendly acoustics and forthright attitude to Italian food. For the moment, that is. Who knows what the future holds for Murano? 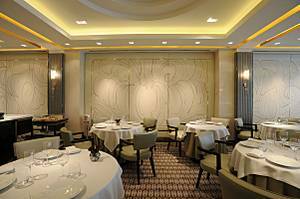 The stately restraint, in both décor and menu, does not quite square with the Angela Hartnett we have all read about. Her favourite restaurant is St John Bread & Wine and her own cookbook brims with simple,gutsy, family recipes. Perhaps one day she will open her own, independent restaurant, free of the constraints and strictures of a big company, but somehow I doubt it. In the starry galaxy that Angela Hartnett now orbits, celebrity chefs like her can only be the chefs they want to be, not the chefs we want them to be; increasingly, restaurants such as this one are launch pad for future corporate business expansion. Still, I love Murano’s glossy charm and the soulful bursts – proper zabaglione! – that Hartnett has somehow managed to shoehorn on to the menu. ‘I just want it to have a spirit of generosity,’ she says. Indeed, prices are fair, although please note that the a la carte seems much better value than the seven course tasting menu, where one course is a salad, and a cheese course comes with a supplement. Get outta town! 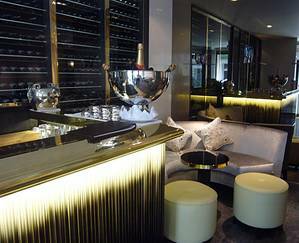 The wine list is pitched at every taste and pocket – there are bottles from £25 to £5,000. Our Vie di Romans Ciampagnis Vieris Chardonnay I Sonzo (£58) is a characterful wine with a minty, melon nose and a New World edge. However, I would not order it again; 14% it is too much for frail old S and me. Annoying, because I did ask the sommelier if it was high in alcohol, and got a flowery and slightly patronising lecture about all the wines on his list being well-balanced, instead of the practical information sought. Yet more Twaddle de Ristoranti, but hardly Angela Hartnett’s fault. 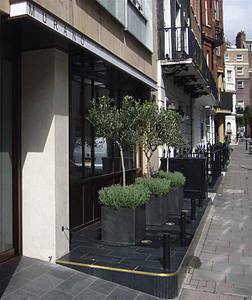 Murano Restaurant, 20 Queen Street, London W1J 5PP. Tel: 020 7592 1222.Three course dinner for two, excluding drinks and service, £110.